Florian and I enjoyed Paweł Ledwoń‘s talk on ‘When WebSockets are not an option’. Paweł, a programmer at Pusher, explained the problem: “there are still people using ancient browsers (or rather: ie7-8) or being held back by selfish proxies. Because of that, it’s difficult to find out which type of connection is best for a client.” Pusher needed a flexible way to tell clients how to establish a real-time connection efficiently. Sure, there are some fallback solutions, using Flash, but the again (quite) some browsers don’t support Flash. The next problem is that some system administrators (especially in big companies) obstruct WebSocket connections with firewalls. As a developer, you just want to have real-time communication and you don’t want to care about what is possible or not, right?! Paweł explained how with Pusher they were able to establish a ‘transparent’ connection, without worrying about WebSockets, Flash-WebSockets or anything. The afternoon program started with an awesome presentation about drones. 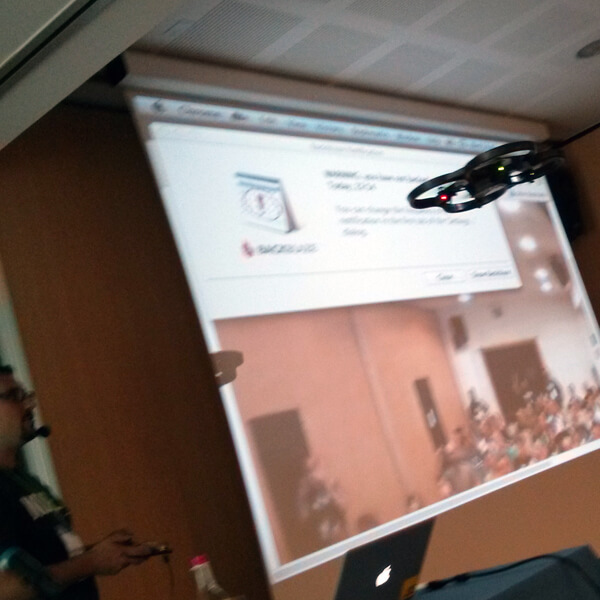 Gilles Ruppert took the Parrot AR.Drone for a spin using this node.js library and johnny-five, which was used to control an Arduino board. Seriously.js for instance, is a real-time, node-based video compositor for the web. Inspired by professional software such as After Effects and Nuke, Seriously.js renders high-quality video effects, but allows them to be dynamic and interactive. It takes a node based approach, each node performs an audio function and connected together to define the overall audio rendering. Transcripts break audio out of its black box and make it navigable, searchable and shareable. The second day of the conference started with a cool talk by Phil Hawksworth posing the question if we are taking proper care of the web. Some web agencies don’t seem to care about bandwidth. Take for instance the the infinite scrolling sites (I think we can all think of a few), which sometimes transfer about 50MB (and 400 HTTP requests) of data for just one site. Hawksworth talked about responsive web design, which led to ‘responsible web design’ and naming the good, the bad, and the fugly of rich interfaces. As sponsors, we had the opportunity to put something in the goodie bags for the attendees. 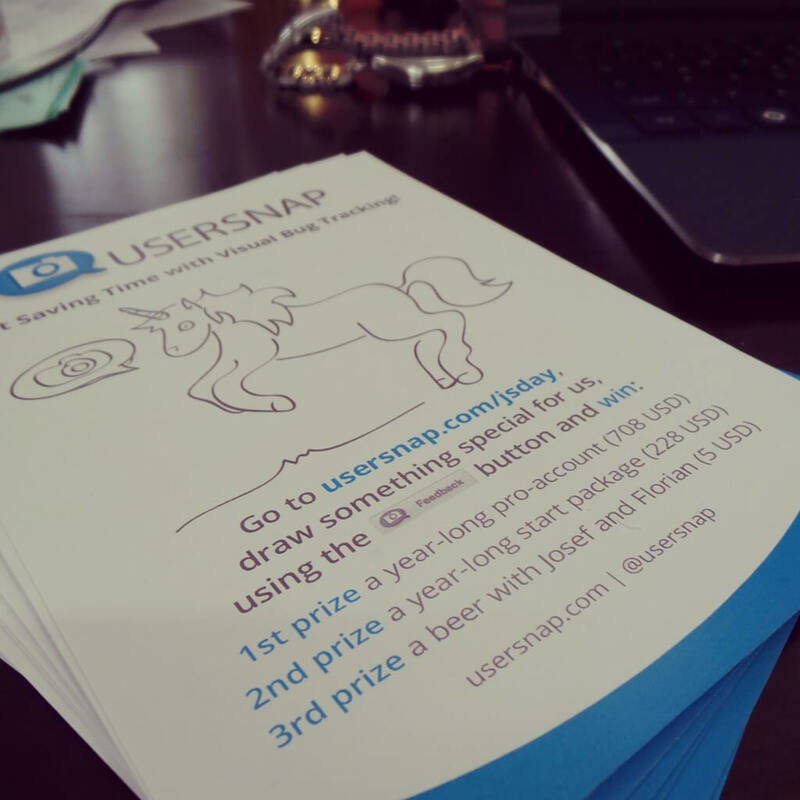 We decided to give away a year-long Usersnap pro-account, worth 708 USD, as well as a year-long basic account and a free beer with your truly, to the conference attendee(s) who’d make the best drawing for us. We could some funny submissions, find the funniest drawings on our Facebook page!